The much debated, controversial collective bargaining bill has finally been passed by the Wisconsin Assembly this afternoon by a 53-42 vote. 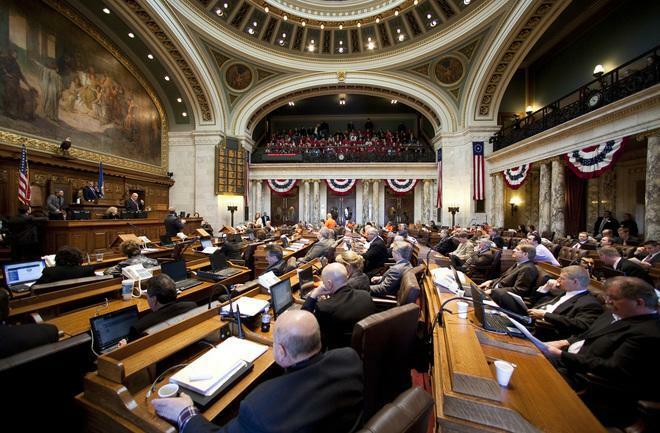 The bill, which passed the state Senate on Wednesday night even without any of the 14 Democrats in attendance, will essentially strip collective bargaining rights from nearly all public workers in the state of Wisconsin. The bill will also bring significant changes to Medicaid programs as well. The next step for the controversial piece of legislation is to be presented to the Governor of Wisconsin, Scott Walker for his signature. This bill has been the center of public debates for weeks now as state workers have protested the fact that Governor Walker is trying to remove their collective bargaining rights. In fact, Assembly Democrats fled the state as an effort to keep the Republicans from having a twenty member quorum that is necessary for all fiscal bills. However, as a way to counter act the moves by the Democrats, Republicans removed the fiscal portions of the bill so that the quorum would not be needed. Protesters were heard outside Wisconsin’s state capitol up to the minute the bill was passed by Republicans. Chants of “Kill the bill!” could be heard throughout the capitol building as the vote was taking place.